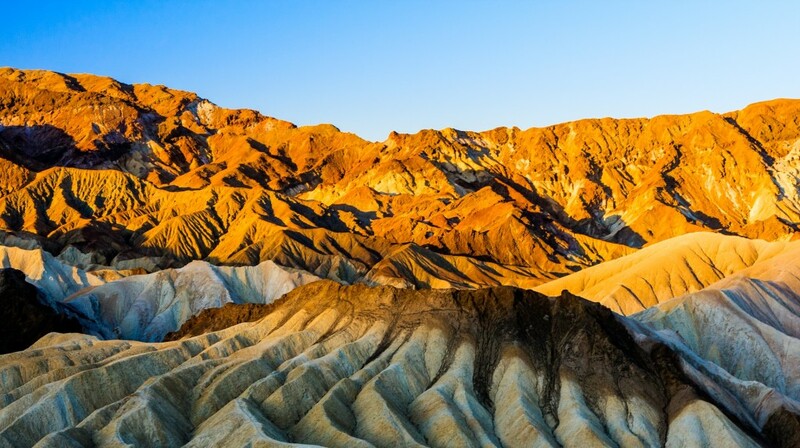 Death Valley is a picturesque desert valley located about 240 km west of Las Vegas, on the border between the states of California and Nevada. It is a biosphere reserve (1984) of 13,500 km2 and 225 km in length, which forms part – together with the Mojave and Colorado deserts – of Death Valley National Park (1994), presenting an interesting, rich and diverse A geological record that over millions of years has suffered up to four periods of intense volcanic activity, as well as sedimentation, various episodes of tectonic deformation and even two intervals of glaciation. Deployed east of Sierra Nevada, in the basin of Badwater, This very rigorous place – one of the driest and most inhospitable of the planet – receives only an average of 50 mm of annual precipitations, registering in 2006 the record of temperature in the zone, with “very worthy” 58,1 ºC (!). Thus, this lethal mixture (at night, the great thermal oscillation causes temperatures to fall from 0 ° C) has always caused the risk of death due to dehydration and / or heat stroke, causes that would charge hundreds of lives during the Vortex of the gold rush that lived the region back in the middle of the s. XIX. Although it has never been too suitable for the survival of humans or other animal or plant species, since the middle of the s. XIX were exploited various mineral deposits of borax (manufacture of soap), copper, gold, lead and silver, though without much success. In fact, with the exception of borax prospecting, only three mines would have been successful enough in the extraction of precious metals, leaving as a witness to the general failure of an extensive trail of abandoned perforations, which may constitute a danger to the unwary who penetrate some They without the slightest precaution. Despite the harsh environment, in its two main valleys (De la Muerte, Panamint) lived from time immemorial the Indian tribe of the Timbisha shoshone (dispersed and in contact with the Amargosa River) and even today a permanent population of sheep of the bighorn breed, scattered in small groups by the desert and its surroundings. It is curious to see it as the lowest point (86 m below sea level) in the USA, when it is only 136 km from the “roof” of the country, Mt. Whitney (4.421 m). Its modern name appears, apparently, of an event happened in 1849, when a group of explorers, seekers of gold and adventurers was lost in the zone, when trying to find a shortcut in the old Spanish way. When, after untold hardships during weeks, the hundreds of chariots managed to leave the valley, one of the women would exclaim “goodbye, death valley”, giving since then the name that still bears the region. Nothing to do with these adventures – and penalties – of the far west and from the gold fever With the comfort of the current times, in which we highly recommend a comfortable visit with Las Vegas (The Sin City) as a starting point / return. That yes: to avoid the summer, like time of elevation merciless of temperatures and of the crowds, what can make really insufrible the exploration of this magnificent, beautiful but inclement surroundings. Suffocations gives thought to it …!